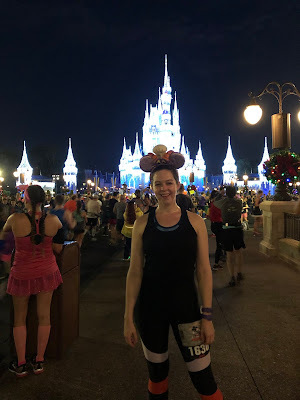 Continuing my trip report for my January 2019 WDW trip. See all the posts in this report here. Onward! The last two years have seen unseasonably chilly temperatures for Florida during the Walt Disney World Marathon. This year, I bolted upright in bed at 2:35am in the morning as always, but to a very different world. 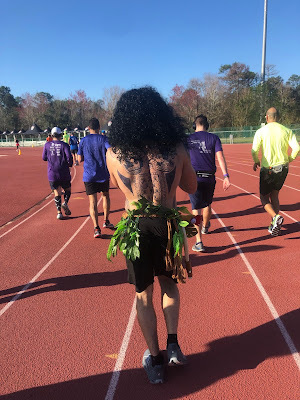 It was already 60 degrees; indeed, I dressed in my Figment best for the race and then topped it off with a single thin long-sleeve shirt as a throwaway. Fancy that - a WDW Marathon where I wasn't freezing to death. Under the cover of darkness that is characteristic of such ungodly hours, I slinked over to the bus stop to... no line at all. I got on the bus and it didn't even fill before leaving. Life in the deluxe resorts sure is spacious. The bus dropped us off at the staging area a little after 3:30am. I busied myself with my usual pre-race ritual: wandering around aimlessly. There were character photo opportunities but the lines were long and already gotten Mickey yesterday, so, eh. There wasn't even a crazy dance party to watch - even the DJ seemed uncharacteristically subdued. He was spinning tunes but you could tell his heart wasn't in it. Eventually the usual runDisney announcer gang showed up, said a few words, and released us to the long walk to the corrals. 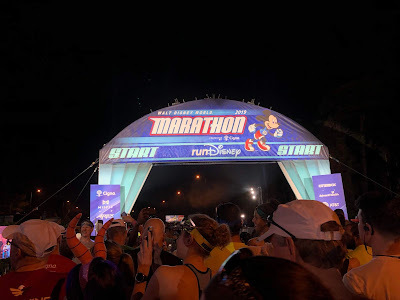 The race got started promptly at 5:30am and they really hustled the corrals through; I was in C and I was crossing the start line a mere 7 minutes later, even sooner than last year. 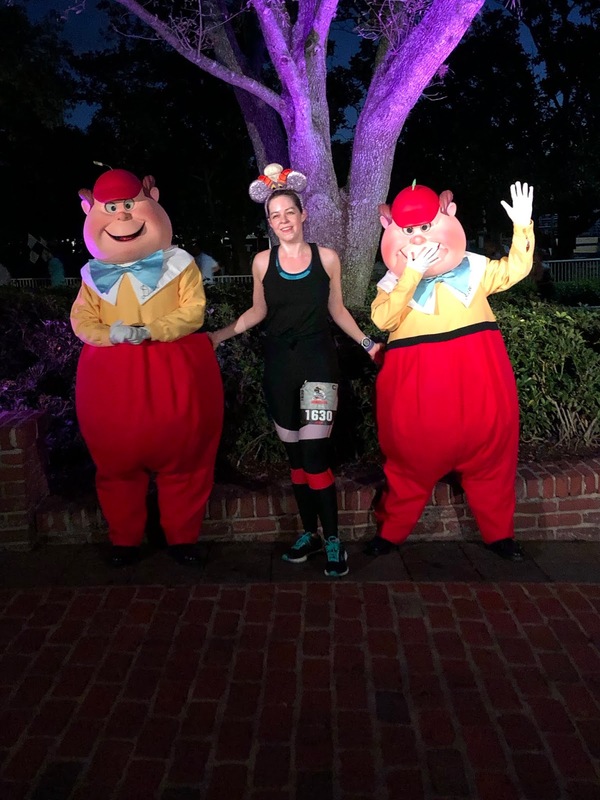 As is annoyingly often the case, I almost immediately needed to pee, but other than that I felt good enough as I began the long run. A merely three miles or so later I came to a screeching halt, for my holy grail of character stops had appeared: DARKWING DUCK! He was paired with Launchpad McQuack as he was the last and only other time I have ever seen him, but for some reason they were only playing the Duck Tales theme song, not DW's. I tried to even the score but running at Darkwing with my arms flung open and he mimed being dutifully flattered, but then I bet he acts that way with all the goslings. Drake Mallard pulls, y'all. And then I stopped to pee at the TTA, which I mention mostly because I totally forgot there was a real bathroom at the TTA so file that information away if you think it might ever prove useful. 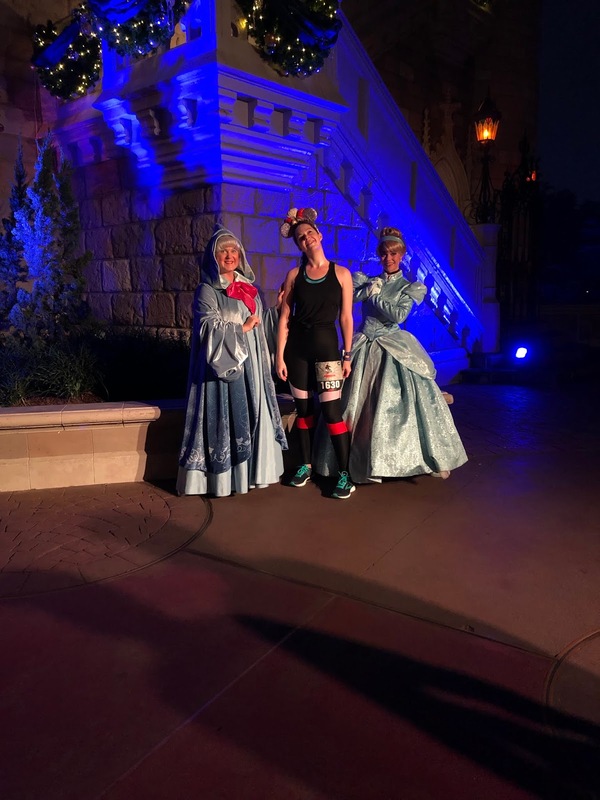 Most of the other photo opps in Fantasyland and Frontierland tempted me insufficiently in proportion to line length, but I had to stop for Cinderella when I saw she was accompanied by the Fairy Godmother. They sounded kinda weird, though - verrrry calm. Like, maybe on downers calm. I dunno. I'm a little afraid of face characters, to be honest. After running through the castle we exited the Magic Kingdom in pretty short order. 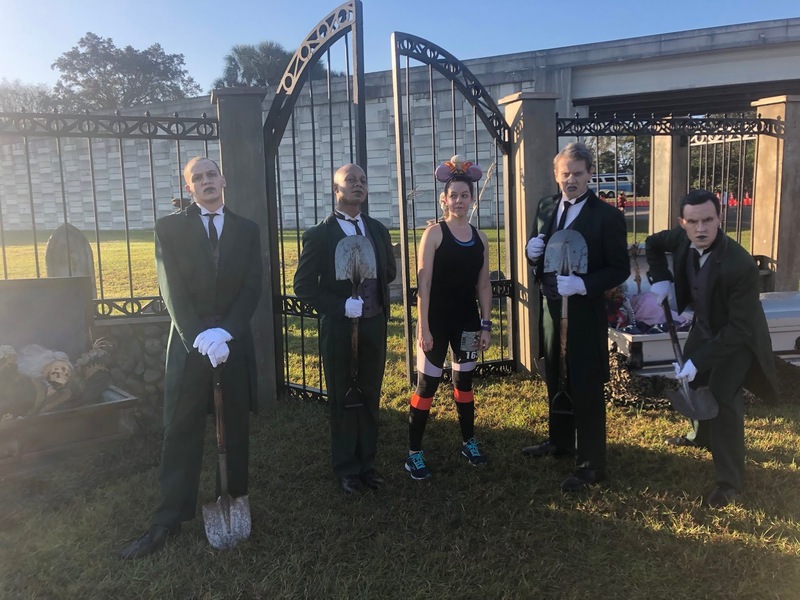 Usually this is where you can pick up a photo with the steampunk Maleficent dragon and her creepy stiltwalkers, but this year she was replaced by a collection of villains. The Imaginners are still working on her firebreathing apparatus, I guess. I don't know if I've ever seen Frollo or Jafar out and about, though, so that was at least interesting. 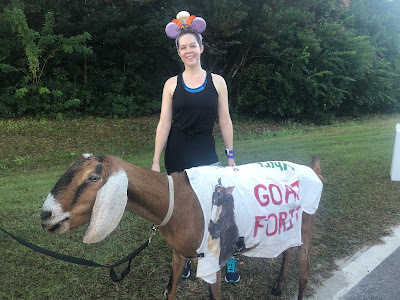 Then I ran away from them and entered my least favorite part of the race: the stretch between the Magic Kingdom and DAK. I know that's early in the race to start getting cranky, but the roads are mostly boring and there's that one obnoxious out-and-back and the sewage processing area that smells bad and there are SO. MANY. MILES. LEFT, you guys. Why do we do this again? 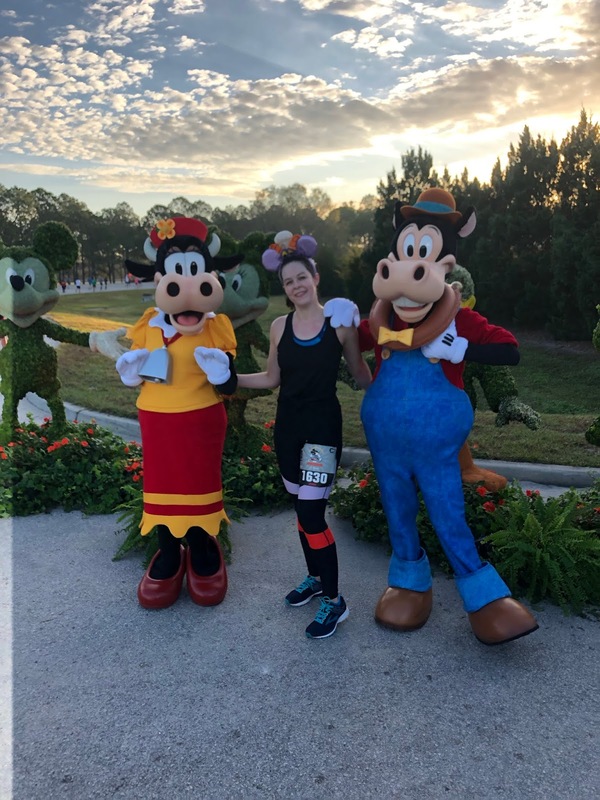 At one point I was so demoralized I stopped for a picture with Clarabelle Cow and whoever this horse is, just to have something to do. Seriously, I thought the horse was Hortensia?? Is it actually Hortense??? What is the truth????? But universe always snaps back into alignment as we approach Disney's Animal Kingdom. 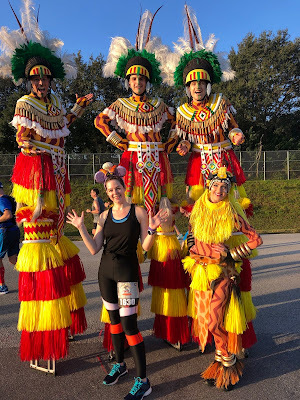 For one thing, I got my ABSOLUTELY MANDATORY photo with the Festival of Lion King stiltwalkers. Not that I'm complaining, but it is CRIMINAL that they never have a line. Then there's the cute animal section! "Anyone need a bunny break?" these CMs asked, and, like, who doesn't? And then I liked the bunny break so much I took a goat break too. Then we ran into DAK proper, where I stopped to pee again because apparently my bladder thought I was making much too good time. But after that everything was lovely. 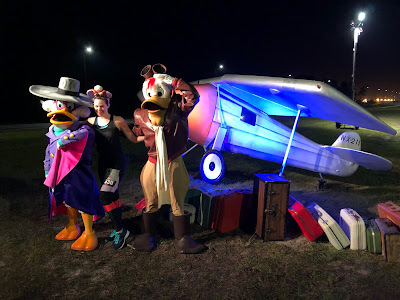 The DAK Cast Members are always out in full force to cheer, and there are usually some good photo stops too. 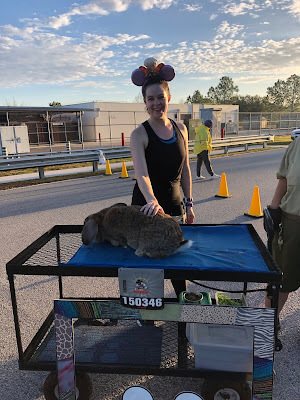 I stopped for a picture with a ballet ostrich from Fantasia, but in that case the CMs were TOO efficient, taking my photo before I was ready and hustling me out. It was almost enough to make me stop for a beer, but I resisted. 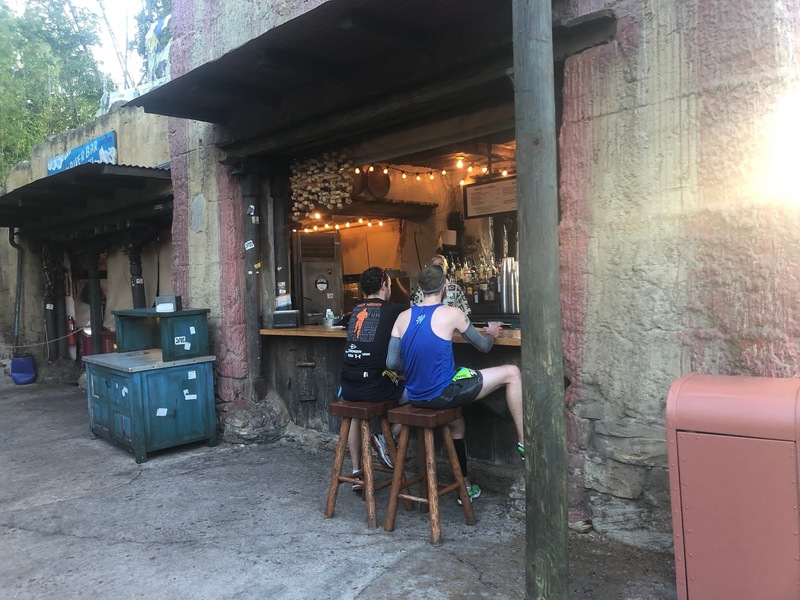 It was too early to wait around for Everest to open up, so I ran on through Dinoland USA and reluctantly exited the park. More boring roads awaited me for some time, but at least now I could remind myself I was over halfway done. 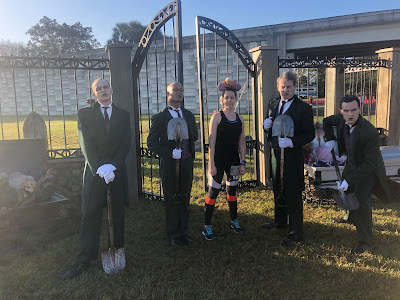 Plus Disney provided an extra gravedigger this year, and who isn't cheered by that? 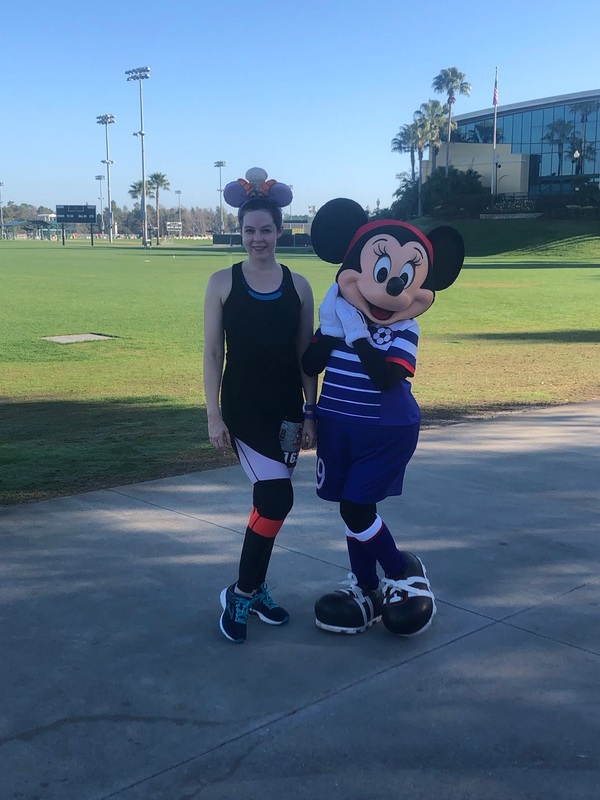 Finally, gloriously, the course wound into the ESPN Wide World of Sports, which I used to freakin' HATE but have developed a strange fondness for. I think it's because as you enter you're closing in on mile 18 and starting to get a little loopy. My IT Band was bugging me, which was annoying because that was a 2017 injury I thought I'd put to rest, but I was getting there! I was closer to the finish than I wasn't! Minnie says put on a happy face! At the entrance/exit to the WWoS there was an announcer repeatedly telling those coming in they were at approximately mile 17.5, which, boo. BUT then we you left, he was telling you you were at mile 20.8, yay! I reminded myself to keep running tall to keep the pressure off my IT Band and kept the pace, even running all the way up the Green Army Man hill. Incredible, right? 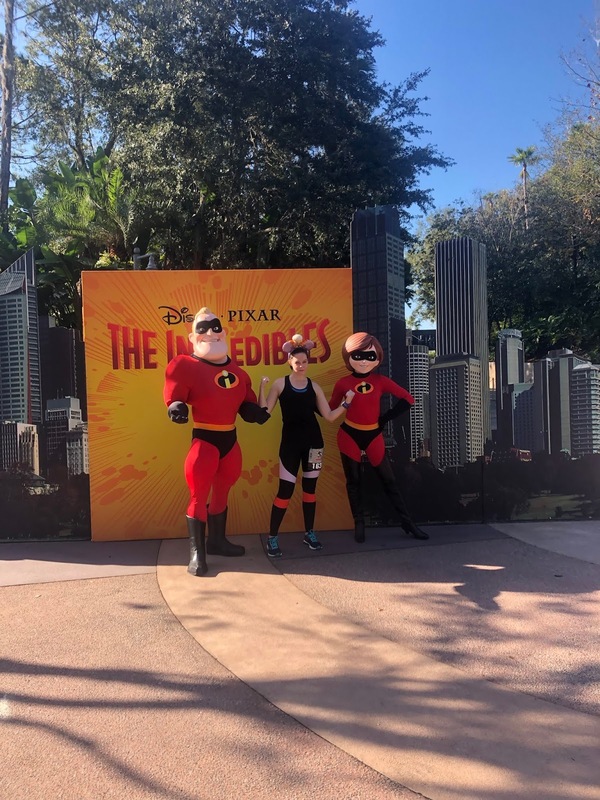 Yes, The Incredibles were but one of the harbingers of the Hollywood Studios. And at this point, guys, I'm not gonna lie - my morale was getting a little low. My IT Band was bothering me and I was tired. I was counting on the Studios, and its many many spectators, to boost me up the way it did last year. I expected zooming energy. But it wasn't coming. What was wrong? I trudged down the path out of the Studios and over to the Boardwalk, which was once again full of a spectacular number of cheering spectators, offering candy, beverages, and support. I kept my chin up but I still wondered where the magic was. Where was my runDisney-induced runner's high? It had usually kicked in by now! And then I ran into the World Showcase and BAM: it happened. 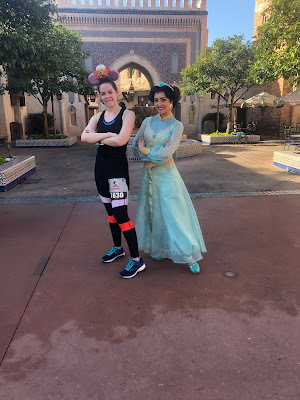 The Disney music was playing, the Cast Members were waving their flags, the finish line was in sight, and I filled up with joy. IT Band? Never heard of it! My pain melted away and I sped past countries, kicking it, passing people left and right. I definitely wasn't about to set any PRs, though, so I figured there was no harm in stopping for photos. I tried to explain to Alice that I did my thesis on her books, but she stayed firmly in character pretending she had no idea what a thesis was. Then I hopped in with Jasmine because I had just finished singing along to "Friend Like Me." 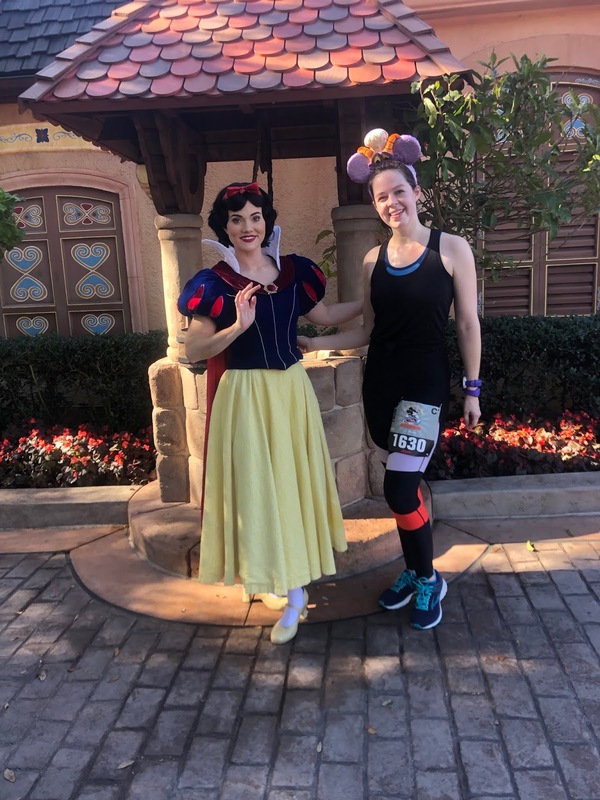 And then I got one in with Snow White because it's THE FAIREST RUN OF ALL, kids. And then I ran down the bridge to Tomorrowland, gazed up at Spaceship Earth while choking back tears, waved to Megan who had moved locations and was sweetly cheering for me even though I was a choked up sweaty weirdo, grinned stupidly at the gospel choir and SPRINTED FOR THE FINISH!!!! And then came to a stop because ow. Whew. Probably one of the harder efforts I've given. The heat and humidity didn't help. But it happened! I was happy! Yay!! Your comment on the face characters cracked me up. 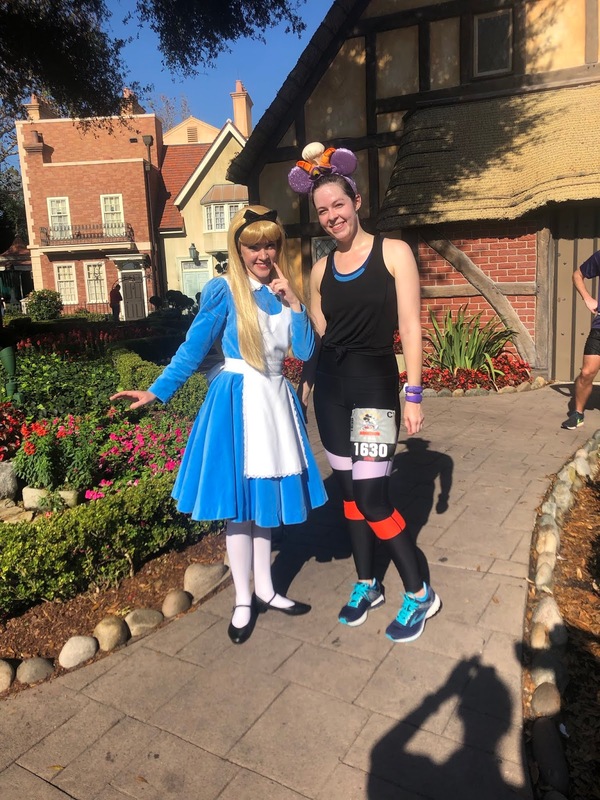 I never got that Disney runners high when I did the marathon because I had so much stuff I was dealing with leading up to it. Which is why I'm hoping I can do it again someday. Face characters can be so weird! They're so indoctrinated that they MUST keep character, and I get that, but then I ended up in a room alone with Elsa and Anna and they kept talking to me about how Olaf likes his hot chocolate and I was like can you just sign this card for my niece so I can roll out because this is really awkward?? ?